Definition: Hygrometer uses for measuring the humidity present in the surrounding environment. The term humidity means the amount of water vapour present in the gas. The physical properties of the material changes by the effect of the humidity and this principle use in hygrometer for measurement. The humidity is classified into two types. The absolute humidity shows the amount of water vapour presents per unit volume. And the relative humidity is the ratio of the actual water vapour pressure to the maximum water vapour pressure reaches in the substance at the particular temperature. The relative humidity depends on the temperature. The following are the classification of hygrometer by the material used for measuring the humidity. 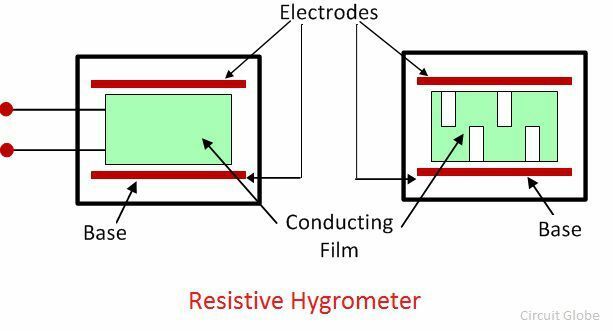 The conducting film of the resistive hygrometer is made by the lithium chloride and the carbon. The conducting film places between the metal electrodes. The resistance of the conducting film varies with the change in the value of humidity present in the surrounding air. The moisture absorbs by the lithium chloride will depend on the relative humidity. If the relative humidity is high, the lithium chloride will absorb more moisture and their resistance decreases. The change in the value of resistance is measured by applying the alternating current to the bridge. 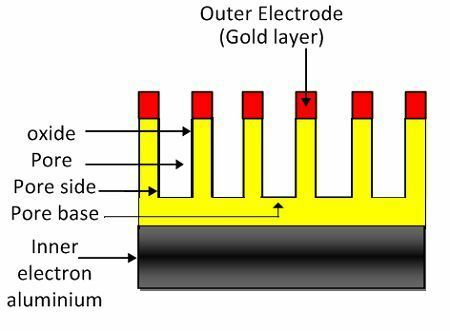 The direct current is not used in the bridge as they breakdowns the layer of lithium chloride. The obstructions occur in the flows of current shows the value of resistance or the value of relative humidity. The change in capacitance of the capacitor shows the surrounding humidity. The capacitive hygrometer gives the very accurate result. It is made by placing the hygroscopic material between the metal electrodes. The hygroscopic material can quickly absorb the water. The material absorbs water because of which the capacitance of the capacitor decreases. The electronic circuit measures the change in capacitance. The microwave refractometer measures the refractive index of the moist air when their humidity is change. The refractive index means the ratio of the velocity of air in one medium to that of another medium. The refractive index of humid air is measured either by measuring the dielectric constant using the capacitor or by measuring the change in frequency. In this hygrometer, the aluminium oxide is coated with the anodised aluminium. The dielectric constant and the resistance of the aluminium changes by the effects of the humidity. The aluminium oxide hygrometer uses the aluminium as their one electrode and the gold layer as the second electrode. The second electrode is porous for absorbing the air vapour mixture. The changes occur in the capacitance and resistance of the material because of the humidity. The change in properties changes the impedances of the material. The impedance measures with the help of the bridge. This hygrometer is the essential component of the electronic system. 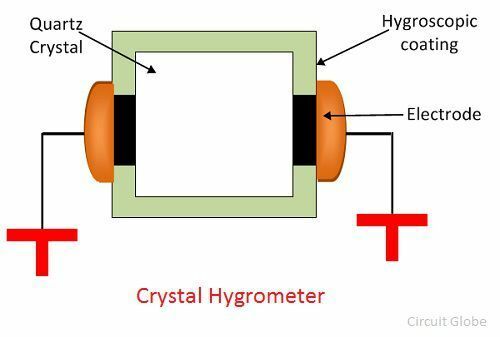 The figure below shows the crystal hygrometer using quartz. In crystal hygrometer, the hygroscopic crystal or the crystal having the coating of hygroscopic material is used. When the crystal absorbs the drops of the water, the mass of the crystal changes. The change in mass is proportional to the total water absorbed by the crystals.